Riverside One - Dock. 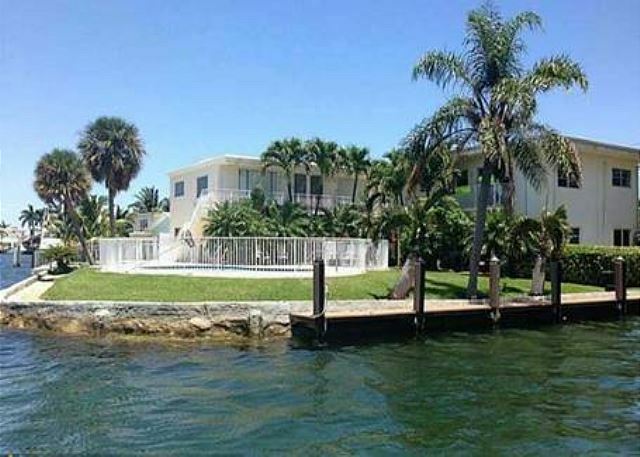 Water Views. Pool. Close to Beach and Cafes. The waterfront lounge area is a great place to sip cocktails before dinner and watch the sunset to the west. 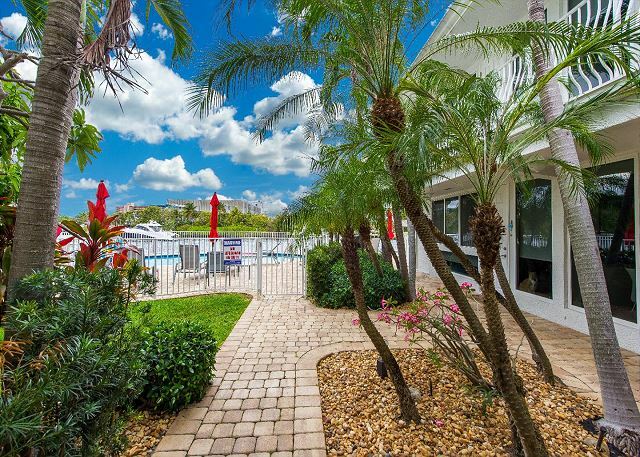 There is plenty of parking for you and your guest in front of your vacation rental. 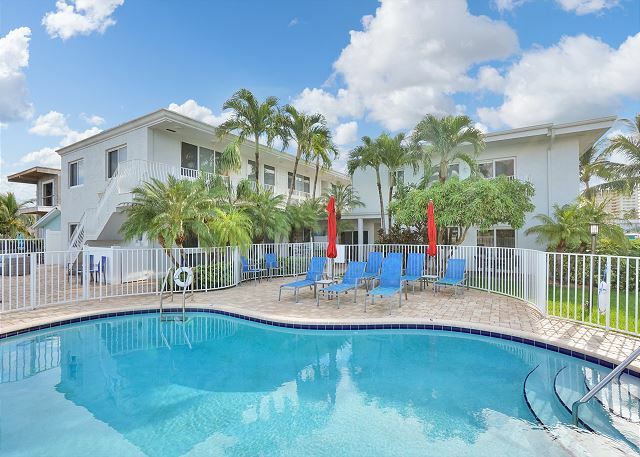 Lounge on the spacious pool and pool deck and work on your tan. 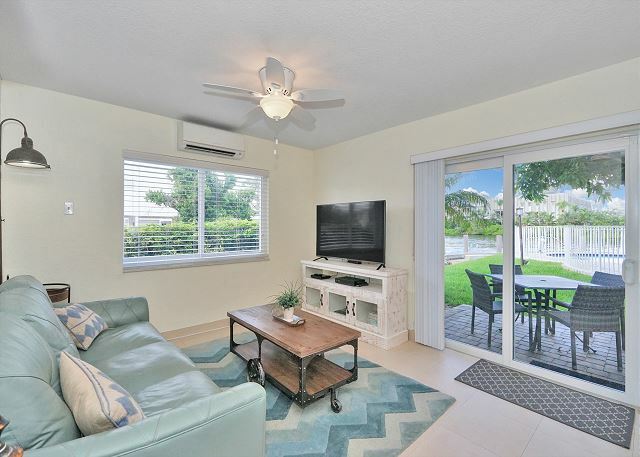 The open floor plan is spacious and beautifully appointed. The leather sofa bed is perfect for relaxing after a full day of sun and fun and can comfortably sleep two. 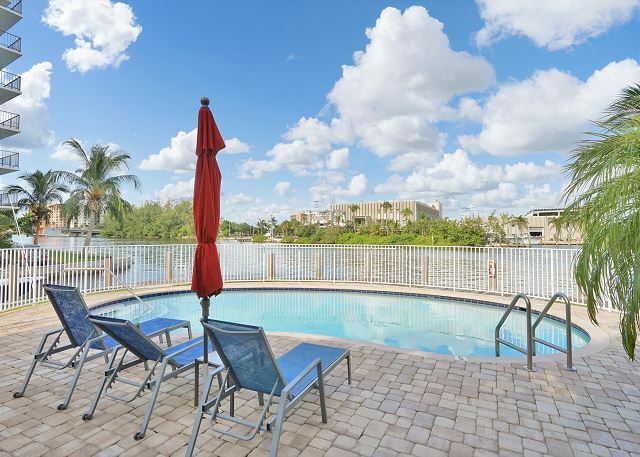 The large sliding glass doors allow majestic views of the Intracoastal. 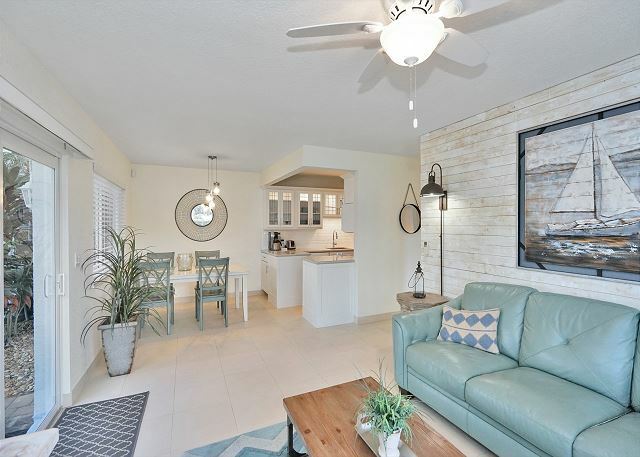 The cheerful decor is ideal for that perfect getaway. Glass windows allow you to see water from every room. 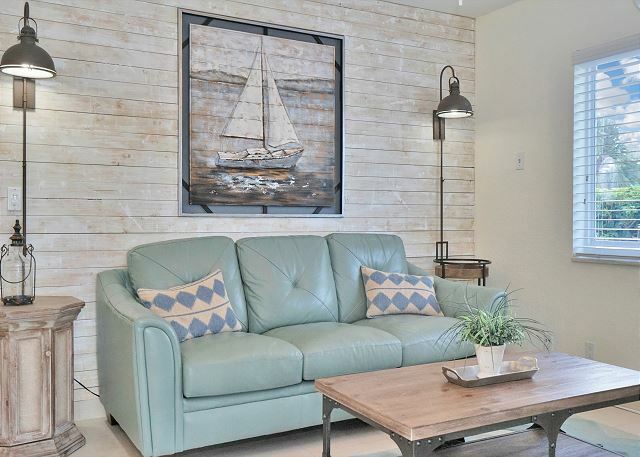 Nautical theme decor makes this vacation rental special. 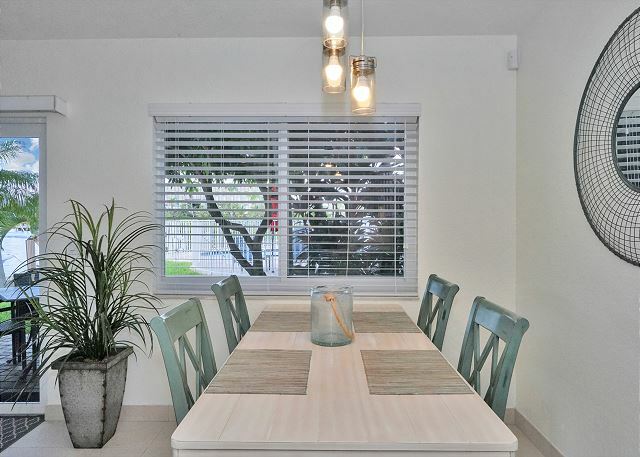 A modern white dining room table allows four people to enjoy their meals. 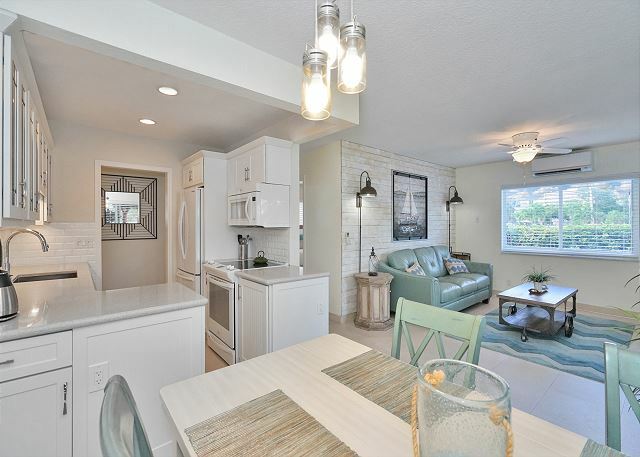 The wide open floor plan offers the finest finishes and decor. The beautiful dining room table has four chairs for elegant or casual dining. 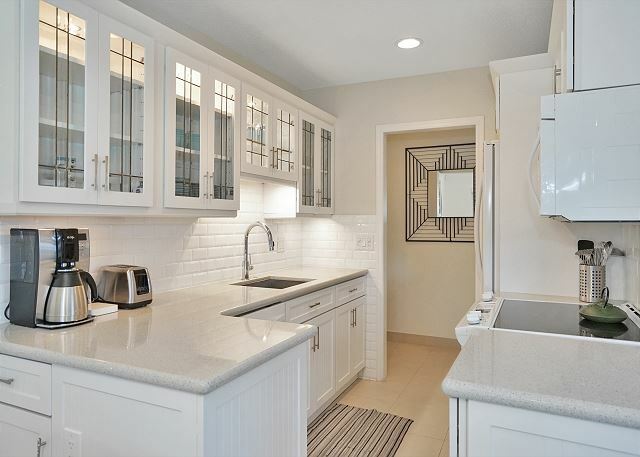 Clean white cabinets and light granite countertops help make cooking fun and easy. 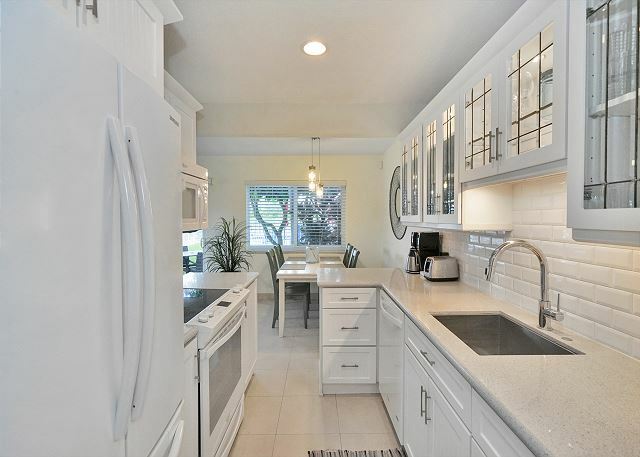 HIgh gloss white cabinets and white appliances are modern and sleek providing a clean and high tech look. 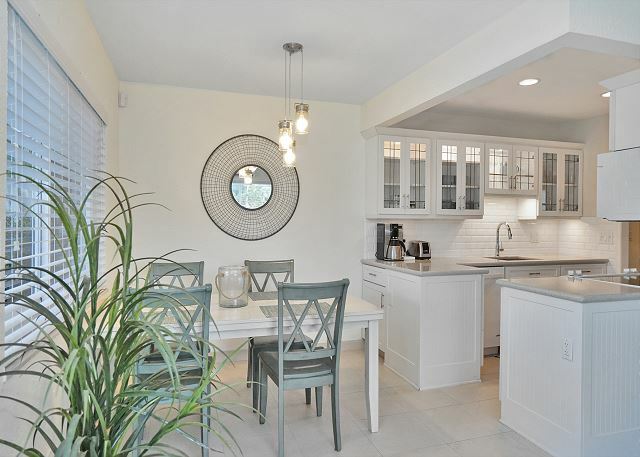 The kitchen is white on white and provides an ideal spot to cook your favorite meals. 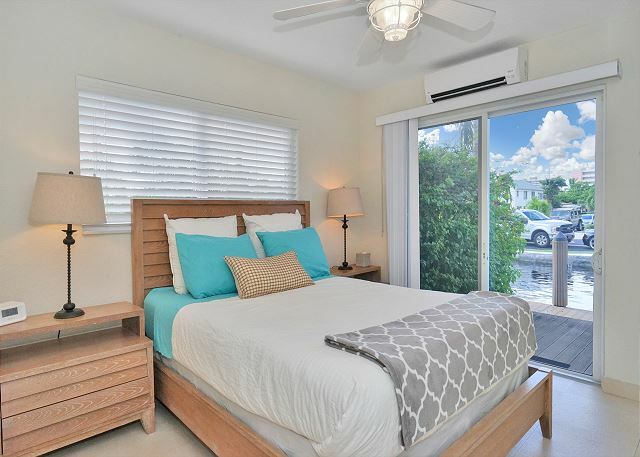 The Master Suite has a queen size bed that overlooks the water in every direction. 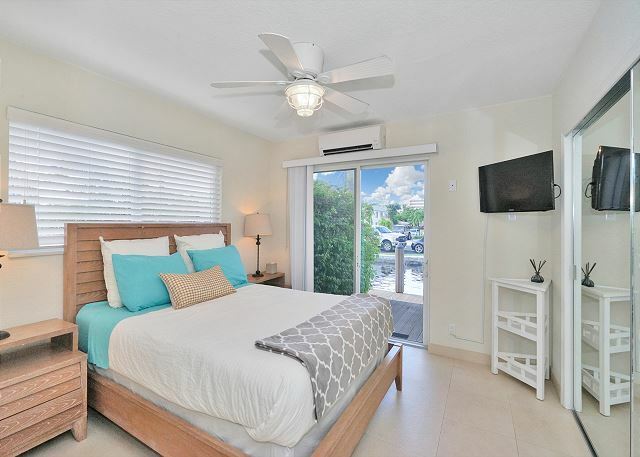 The Master Suite has a large TV screen to watch your favorite late night shows. Whether dressing for the beach or going out on the town, the large mirrors allow you to primp up before leaving. 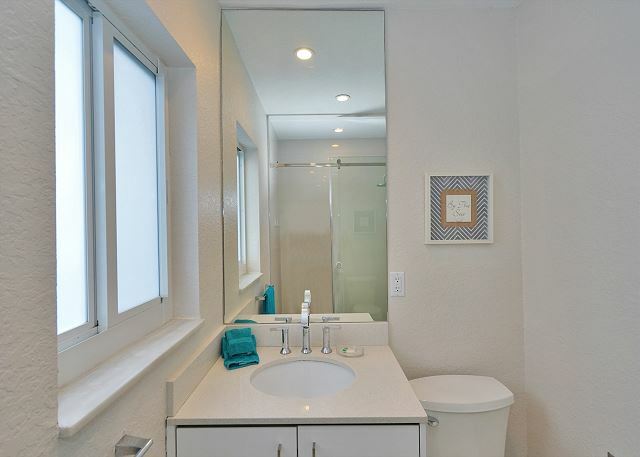 The Master Bathroom vanity has quality finishes and fixtures and light counter tops. 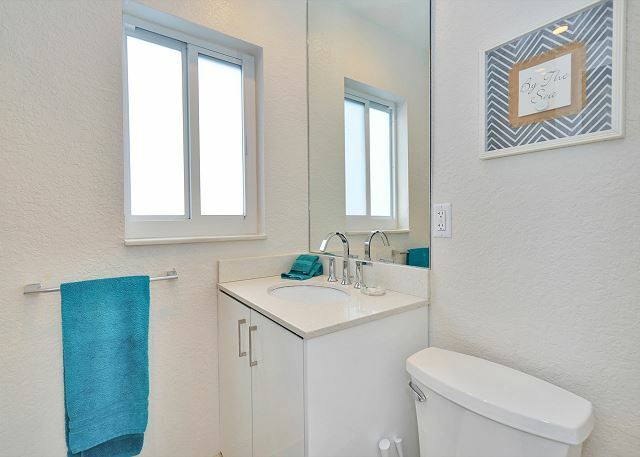 The master bathroom is white-on-white with a touch of color and elegance. 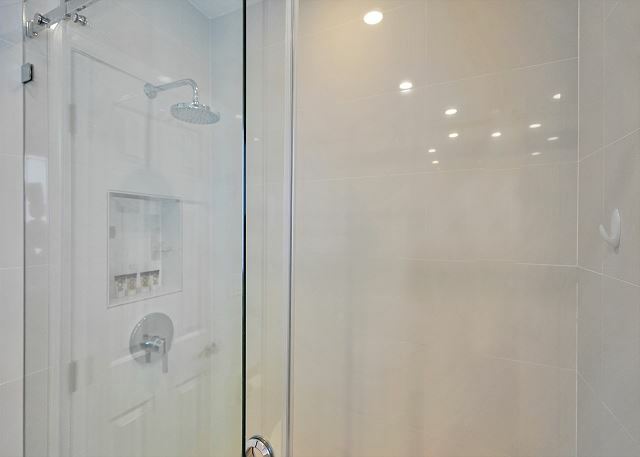 The master bathroom has a seamless glass shower enclosure with tile walls throughout. 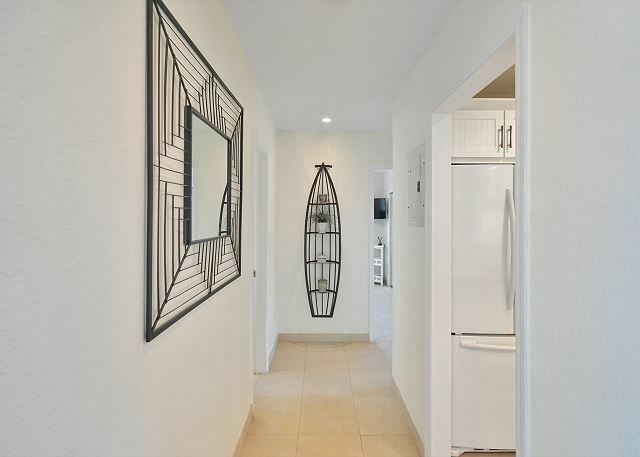 The short hallway connects the kitchen with the open space. 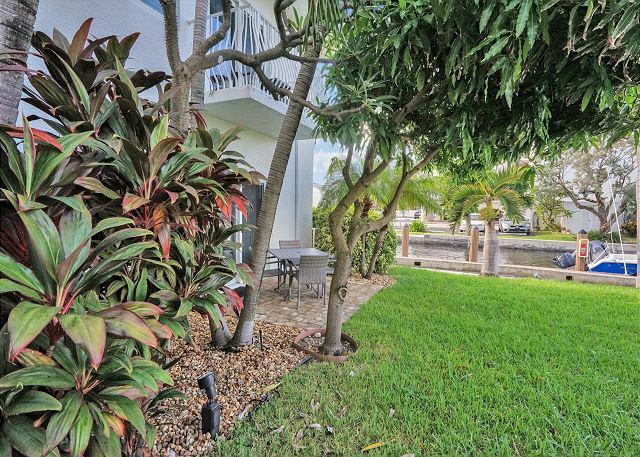 Back grassy area is lushly landscaped and overlooks the water. 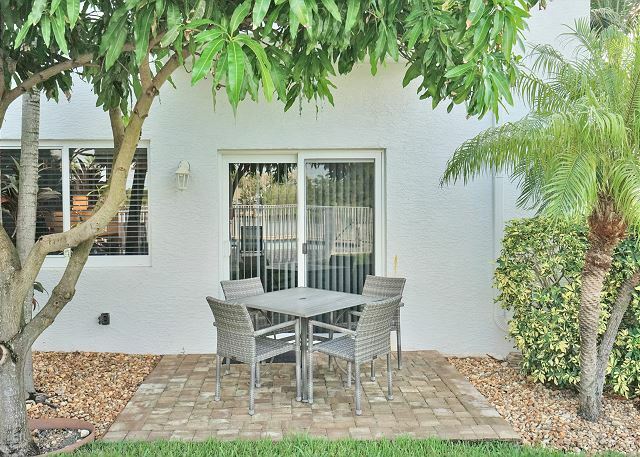 The outdoor private patio is great when sipping coffee in the morning or having an afternoon snack. Stroll along the pathways and admire the tropical palm trees and rock garden. 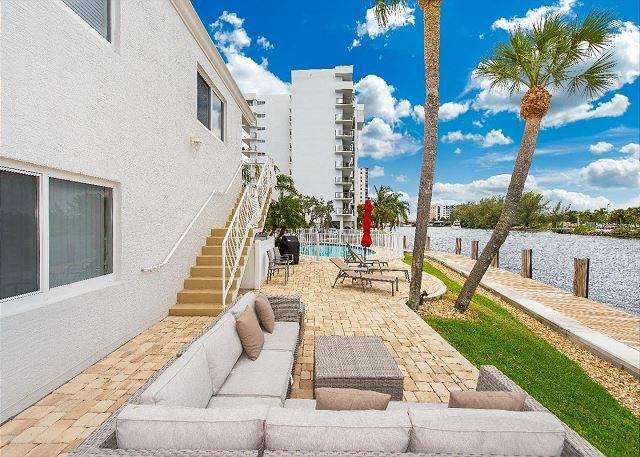 Read a book or check your emails while lounging on the pool deck. 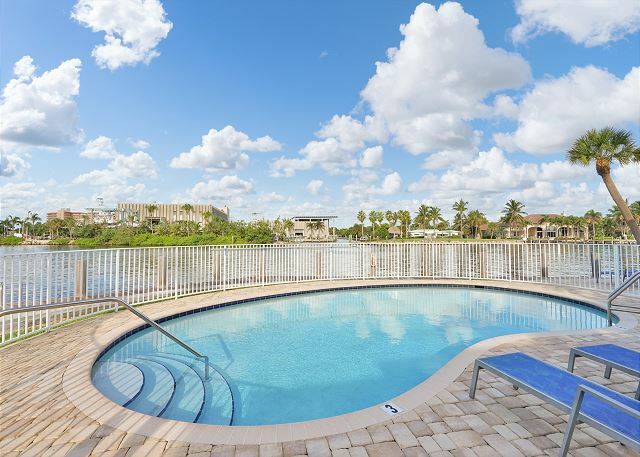 Take a refreshing dip in the pool after a day collecting shells at the beach. The comfortable outdoor lounge area can entertain small or large groups easily. 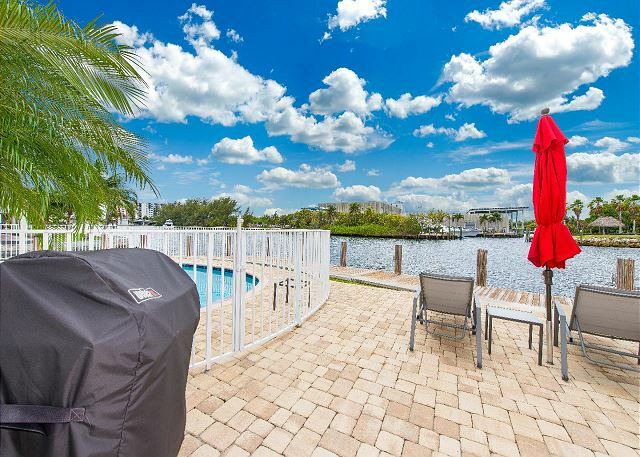 Relax in the chaise lounge chairs while grilling your favorite steak or fish. The loungers and umbrella are for you to enjoy on a sunny day. 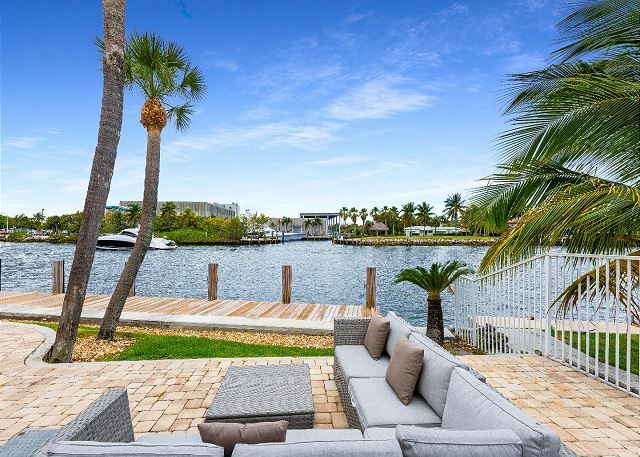 Admire the Intracoastal while relaxing in the chaise loungers. Break out your fishing rod and catch some grouper for dinner. 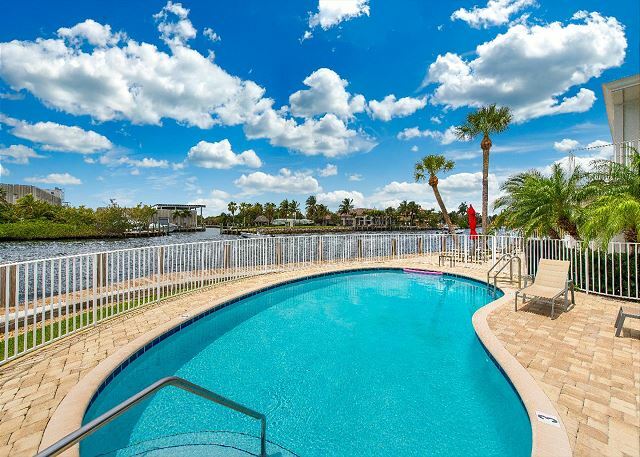 Enjoy the magnificent views of the Intracoastal Waterway from your backyard. 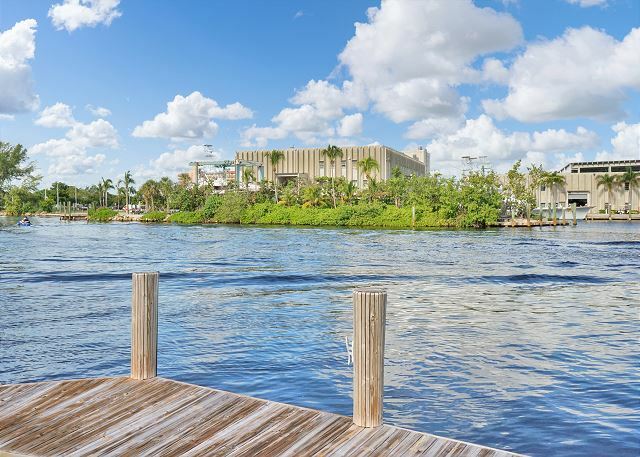 With water views from every room, this is the perfect spot for your next romantic getaway. 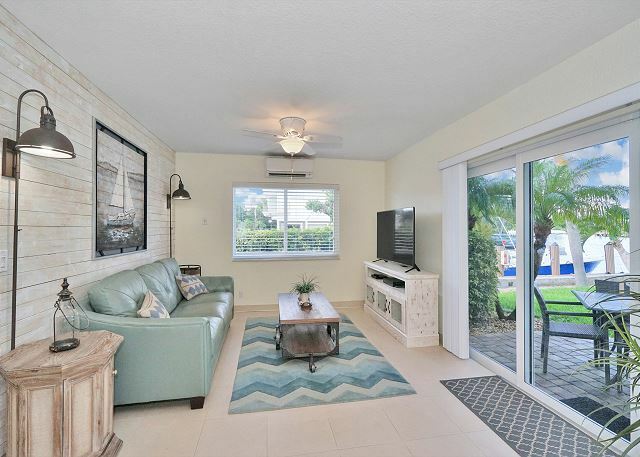 Park your boat at the dock for $50/night including water.Upon entering, you’re greeted with porcelain white floors and coastal décor in cool, calming colors. 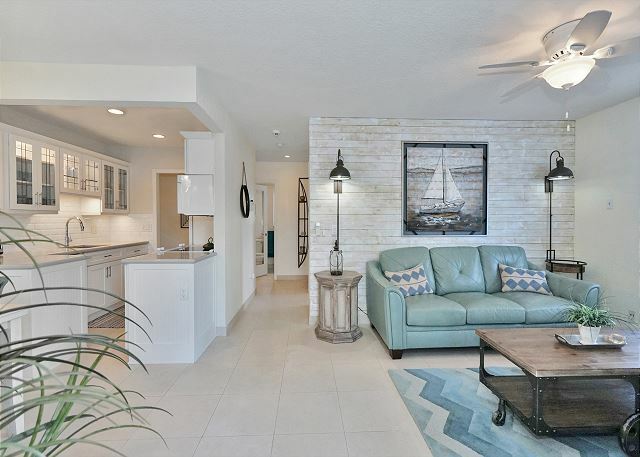 After a day in the sun, relax on the aqua green leather sofa bed that sleeps two in the light-filled living room and gaze out at the water or cuddle up with your mate and catch up on your favorite shows on the 60” flat-screen TV. Gather at the four-person dining table for a meal of local seafood or a prime meat of your choice. 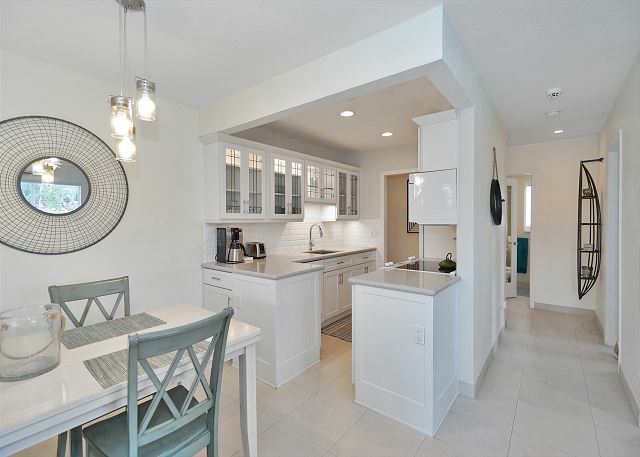 In the updated kitchen, you’ll find everything you need to prepare meals in a relaxed, contemporary environment. 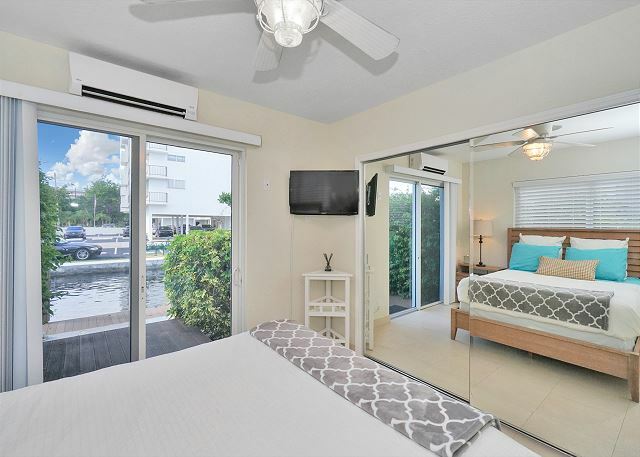 In the bedroom, you’ll find a queen bed, flat-screen TV, and glass sliding doors that lead to a deck overlooking the water. Drift off to sleep with the gentle sound of water lapping just outside. The nearby bathroom includes a walk-in shower. A sliding door opens to a brick patio with a table for four and views of the pool. 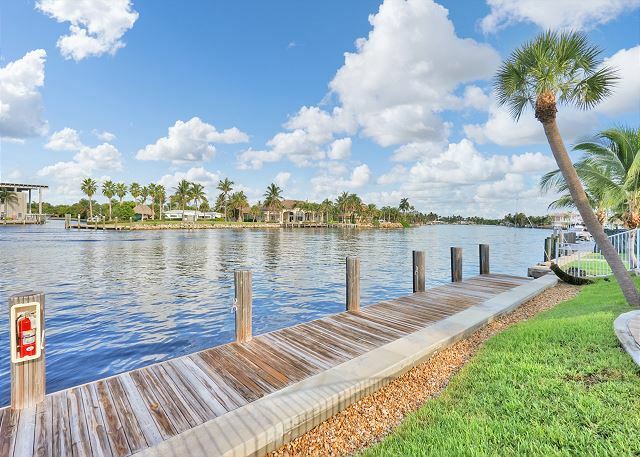 Enjoy an al fresco dinner or sip your coffee in the cool morning breeze as you watch the yachts glide by on the Intracoastal Waterway. 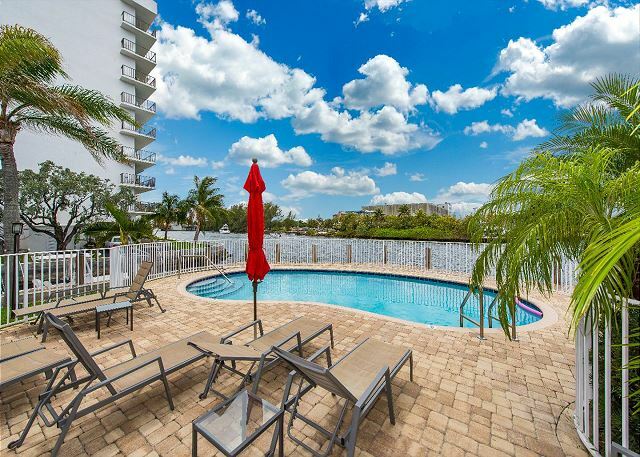 Pompano Beach is just two blocks away. 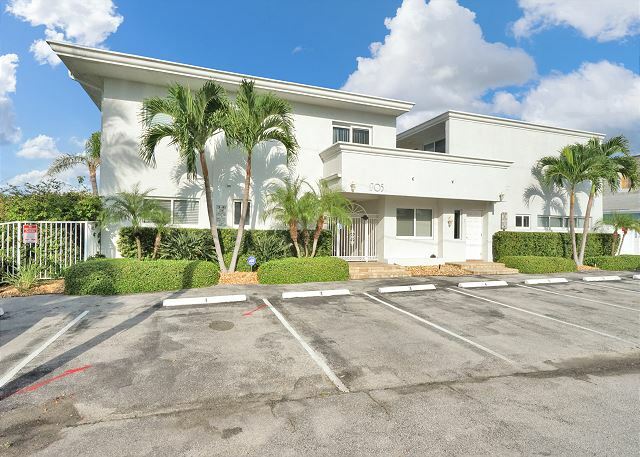 You’re also a short drive to Deerfield and Lauderdale beaches (15 to 20 minutes by car), where you can enjoy pubs, cafes, and restaurants. 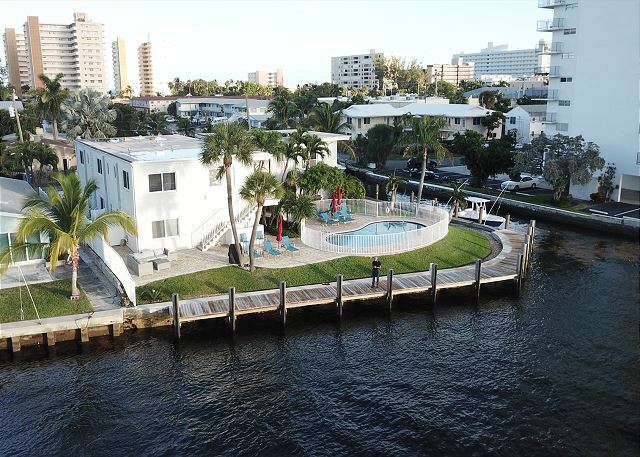 For an unforgettable Oceanside meal, be sure to check out Ft. Lauderdale’s Oasis Café, aka Home of the Swings. 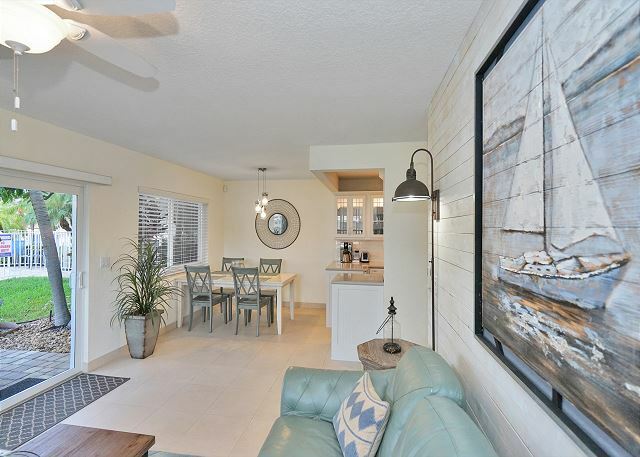 Seaside Grill is within walking distance from the condo. The Rusty Hook Tavern and Sunset Catch are both about six minutes by car. 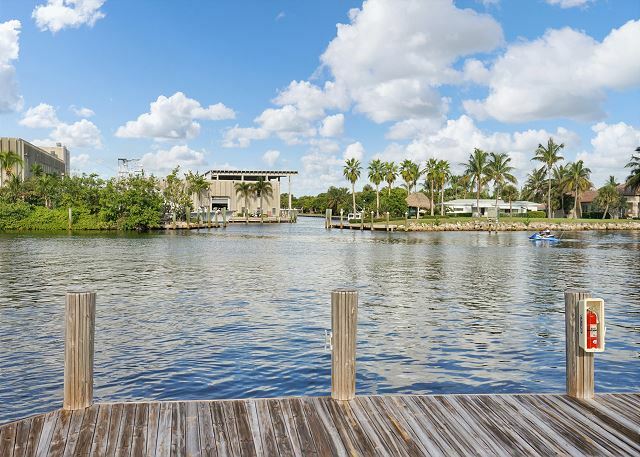 Adventurers will love Life’s a Beach Watersports (six-minute walk); find all your jet ski, paddleboard, and kayak rental needs in one place. 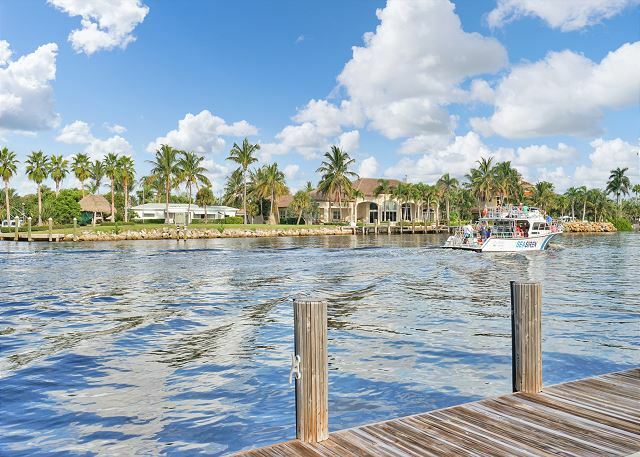 For scuba diving and snorkeling trainings, rentals, and charters, check out South Florida Diving Headquarters, just six minutes by car.